Unitarian Universalism includes aspects of many of the world’s religions. Traditional holidays from various religions are celebrated together in UU congregations. Most congregations celebrate the Christian holidays, Christmas and Easter; the Jewish holidays Passover and Yom Kippur; and the Pagan Winter Solstice, among other holidays. In addition to these traditional religious holidays, many UU congregations also honor secular holidays including Earth Day, Martin Luther King, Jr. Sunday, Mother’s Day and Father’s Day, Memorial Day, Labor Day, and Thanksgiving. While these are not traditionally spiritual holidays, Unitarian Universalism finds spiritual meaning and affinity with our Principles in the ideas behind these and other secular holidays. There are two holidays that many Unitarian Universalist congregations celebrate that are unique to our faith: the Flower Communion and the Water Communion. Both holidays are ceremonies that celebrate our Unitarian Universalist community and the importance of each individual’s unique contributions to that community. The Flower Communion takes place in the spring. Each congregant brings a flower to the Sunday service and places it in a shared vase near the podium. During the ceremony, the flowers are blessed by the minister, and each person selects a flower from the bouquet other than the one that he or she brought. The Flower communion service was originally created in 1923 by Unitarian minister Norbert Capek, who founded the Unitarian Church in Czechoslovakia. The service was later brought to the United States by his wife, Maya. The Water Communion was first held at a Unitarian Universalist worship service in the 1980s. Many UU congregations now hold a Water Communion once a year, often at the beginning of the new church year (September). Members bring a small amount of water from a place that is special to them or use water provided in a pitcher at the front of the sanctuary. During the appointed time in the service, people one by one pour their water into a large community bowl. The combined water is symbolic of our shared faith coming from many different sources. It is often then blessed by the congregation and is later boiled and used as the congregation’s “holy water” in child dedication ceremonies and similar events. Unitarian Universalist religious ceremonies, like the rest of our faith, are always unique, always changing, and are determined by the beliefs of the individuals participating. 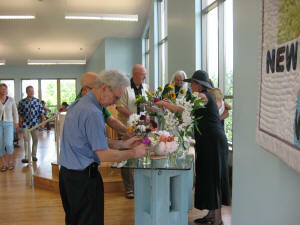 Some ceremonies within Unitarian Universalism, like weddings, often follow traditional formats. Others, such as our Coming of Age services, are wildly creative and constantly evolving. Rather than holding Christian-style baptism ceremonies, most Unitarian Universalist congregations have child dedication services for infants, young adopted children, or young children whose families have recently joined the congregation. The parents bring the child to the front of the sanctuary at a designated time in a regular Sunday worship service, and the minister presides over the ceremony. The dedication ceremony is generally a celebration of the blessing of new life, an expression of the parents’ hopes for their child, and a call to the parents and the congregation’s members to lead and nurture the child’s spiritual life as it grows. Adults are not required to be or become baptized when joining the Unitarian Universalist faith. Learn more about becoming a member. Several times a year, we welcome new members (those who have signed the membership book) into the congregation during a Sunday service. The Minister, Board president, and congregation welcome the new members, and all read the UUC Covenant together. New members are presented a rose. Some traditions are specific to our congregation. These events are traditions that congregants look forward to participating in every year. In December, members of our EarthSpirit Sisters group hold a celebration for all ages close to the Winter Solstice. The celebration usually includes walking a spiral path, an outdoor fire, a story and refreshments. Our annual egg hunt goes to the dogs…literally! Congregants donate items to benefit the Humane Society of Montgomery County, then children hunt for those items on Easter morning. All the fun of an egg hunt in a social action project!